No, not that frozen. Sorry. Aaron wanted to get a deep freeze for the longest time, and I never really thought it sounded all that necessary. But he wouldn't let it go (again, sorry) and we got one this year. Let me tell you, I love having it! We always buy meat and other freezable food items when they go on sale, and now we actually have space to store them. So this week's meals were brought to you by beef and chicken from the freezer. 1. Easy Homemade Burrito Bowls from Iowa Girl Eats (can you tell I love that blog?). Home freaking run. Chipotle is pretty much its own food group in our house--even Jona can tackle a bean and cheese quesadilla--so finding an easy make-at-home version is a wonderful thing. My burrito bowl was filled with rice, black beans, chicken, grilled red peppers, corn, Monterey Jack cheese, and guacamole. Mmmm. 2. Sour Cream Noodle Bake from the Pioneer Woman. This was an easy, hearty, comforting dish, perfect for fighting the Monday blues. Instead of layering the pasta and meat sauce like the PW did, I took the ultra lazy route and just mixed the pasta with the meat sauce and sour cream (I left out the cottage cheese), poured it in a baking dish, and topped it with shredded cheddar. I kind of want to eat that again right now! 3. Healthier General Tso's Chicken from Hello Natural. Have you ever made a recipe and loved it, and then for some reason when you make it again it's not the same? I'm not sure what it was, because I really loved this when I made this a while ago. Aaron thinks I'm crazy because he liked it both times. It's a good recipe, I think it was the cook's error this time. It's possible I went a little overboard with the apricot jam. Or maybe my Panko bread crumbs were stale. I keep them in the freezer, but I think they'd been in there for a little too long. Who knows. Anyway, I'm willing to give it another chance. It is awfully pretty. What was on your menu this week? I need to read more of Iowa Girl Eats - so many of those recipes sound so tasty! 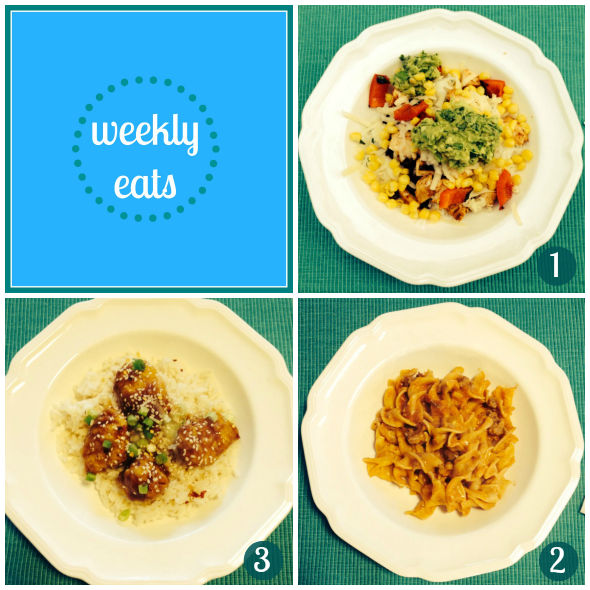 We didn't have anything terribly exciting this week for meals. I think we're stuck in a rut! Need to change that soon. Oh, I would love to try the general tso's chicken! Its tasty, but I hate ordering it out because it just seems so bad for you.